As it emerged in the mid-1960s, American minimalism was the subject of theoretical and, later, historiographical critical debate. Few artists recognized themselves in this term, which seemed to respond more to the formal appearance of their works than to innovations in conceptual process, production, and presentation. The exhibition A Different Way to Move: Minimalisms, New York, 1960–1980, presented this year at the Carré d’art-musée d’art contemporain, Nîmes, (April 6–September 17), suggests another approach to this chapter of art history. By expanding a narrative usually founded solely on the visual arts, the exhibition shows how important it was for a community of New York artists to experiment in the field of dance and choreography, first in Yoko Ono’s loft and then, beginning in 1962, around the Judson Memorial Church. In this dialogue, the exhibition’s curator, Marcella Lista (Chief Curator, Musée national d’art moderne, Centre Pompidou, Paris), will discuss with Valérie Mavridorakis (Associate Professor, Haute école d’art et de design-HEAD-Genève) a pluralistic interpretation of this artistic scene, resisting the temptation of a formalist approach, so as to present more fully the corporeal and kinesthetic experimentation that underlies the three-dimensional abstraction of the 1960s and 1970s. This dialogue is part of the annual Semaine des cultures étrangères, organized by the Forum des instituts culturels étrangers à Paris (FICEP). 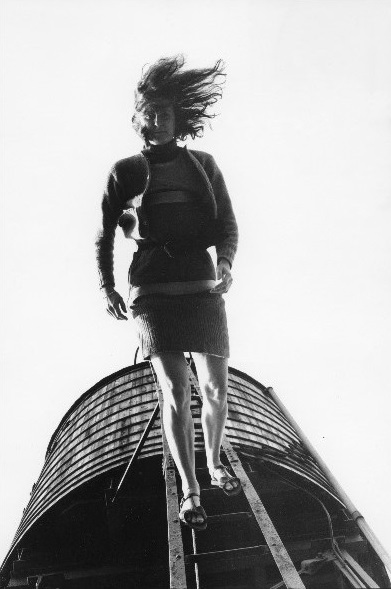 Babette Mangolte, Trisha Brown, Woman Walking Down a Ladder, 1973. Photo © 1973 / 2010 Babette Mangolte, Courtesy of the artist & Broadway 1602.